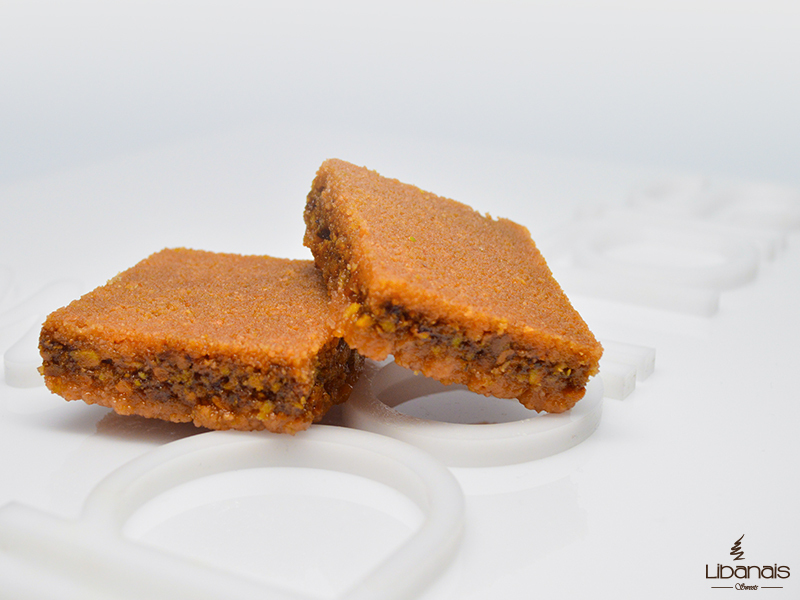 Libanais’ signature delicatessen: Semi-chopped pistachios sandwiched between layers of our special knafeh dough. Baked to perfection and topped with rich almonds, pistachios, and pine nuts. It is juicy and soft. Pistachio, sugar, flour, ghee, almonds. It is the richest, most luxurious, and most desired piece of all Assorted Baklava sweets. Filled with pistachios on the inside and garnished with almonds, from the top, it is the richest piece in nuts. It is juicy, soft, and very sweet. Pronounced [bas-mah], it comes from the Lebanese word for “a smile”. Well, it is guaranteed to put a smile on your face from the first bite. The grounded Knafeh dough is prepared, then multiple layers of dough and nuts are stacked and baked. Knafeh dough consists solely of flour and water. To prepare it, flour and water are mixed for about four hours to form a watery mixture. Then the mixture is poured into a special container that contains small holes in its base and placed on top of a hot surface. As the watery dough mix passes through the holes, it forms filaments of dough. The container is moved along the hot surface as the dough mixture drains through the container to form long strings of dough. The strings of dough are let to dry, and are then grounded. Voila, you got the grounded Knafeh dough. Ghee is spread on a baking sheet, then pistachios, pine kernels, and almonds are added. Next, the grounded knafeh dough is added on top of the nuts. The dough is topped with a layer of pistachios mixed with sugar to form the filling of the Basma. Finally, a second layer of grounded knafeh dough is applied. The Basma made of layers of dough and nuts is initially baked for 20 minutes on medium temperature, then flipped over and baked for another 20 minutes. After baking, sugar syrup is added. Basma is served as a dessert. It is usually served as part of Baklava assortments. Basma is mostly popular in Lebanon. Basma is one of the assorted Baklava pastries that are made with knafeh dough. Assorted baklava desserts are made of two forms of dough: Paper thin sheets of phyllo dough and thin strings of dough called knafeh dough. Basma requires the initially stringy knafeh dough to be shredded.